As noted in a previous post, most of the articles from the Jewish Temple in Jerusalem had been placed in the Temple of Peace in Rome—but in A.D. 192 the Temple of Peace was burned down. There are two important discussions that trace the history of the articles after this event—one by Fredric Brandfon and the other by Clyde Billington (see below). A.D. 192 — Billington (p. 18) argues that “. .. the Temple Menorah and the other ‘Treasures of the Jews’ were rescued and placed in the royal palace where, according to the Byzantine historian Procopius, they remained until the mid 5th Century AD.” This would mean that they were kept in one of the Palaces on the Palatine Hill. A Garden from the Palace of Domitian on the Palatine Hill in Rome—where the Royal Palaces were located. Click on Image to Enlarge and/or Download. 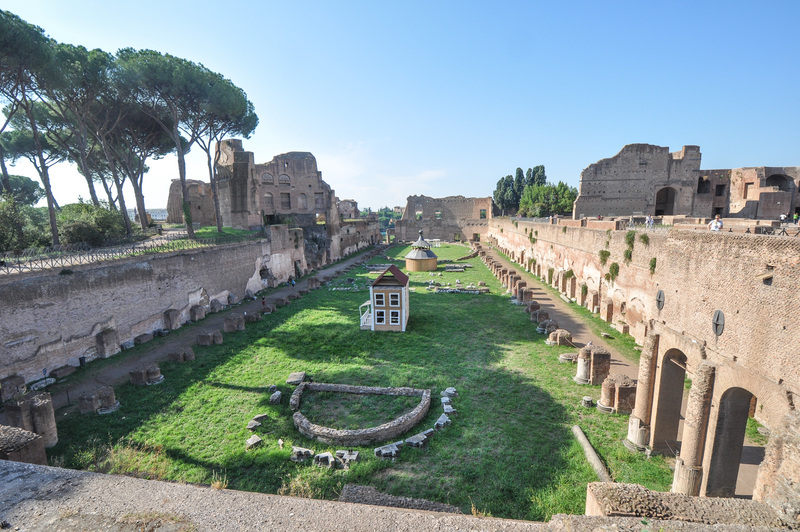 Click Here to view images of and on the Palatine Hill. In A.D. 445 Gaiseric and the Vandals conquered and looted the city of Rome and “carried off the Temple Menorah and the other Treasures of the Jews . . .” to their capital city of Carthage in North Africa (Billington, 18). Procopius of Caesarea also describes how later, the Byzantine general Belisarius conquered Carthage in A.D. 534. He then goes on to describe the victory parade of the booty in Constantinople in the presence of the Emperor, Justinian (r. 527–565). Conveniently, Billington provides his translation of the relevant passage from Procopius of Caesarea’s, History of the Wars (p. 18). 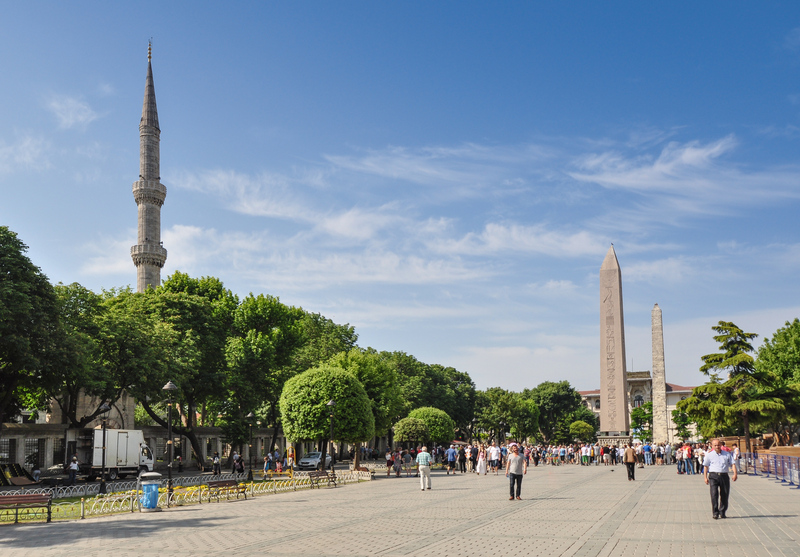 The Hippodrome in Constantinople (modern Istanbul) where the victory Parade may have taken place. Thus the Temple Treasure was brought to Constantinople in A.D. 534. But Procopius also says that one of the Jews warned that a curse would fall on Justinian, the Emperor, if the treasure was not returned to Jerusalem! Billington’s translation continues . . . When the Emperor (Justinian) heard of the things that were said (by this Jewish man), he became frightened, and with all haste sent all of these (sacred Jewish) items to the Christian churches in Jerusalem. At this point, Billington has a detailed discussion of exactly when the articles were sent to Jerusalem, but both he and Brandfon agree that they were placed, for a time, in the newly built Nea Church dedicated A.D. 543. 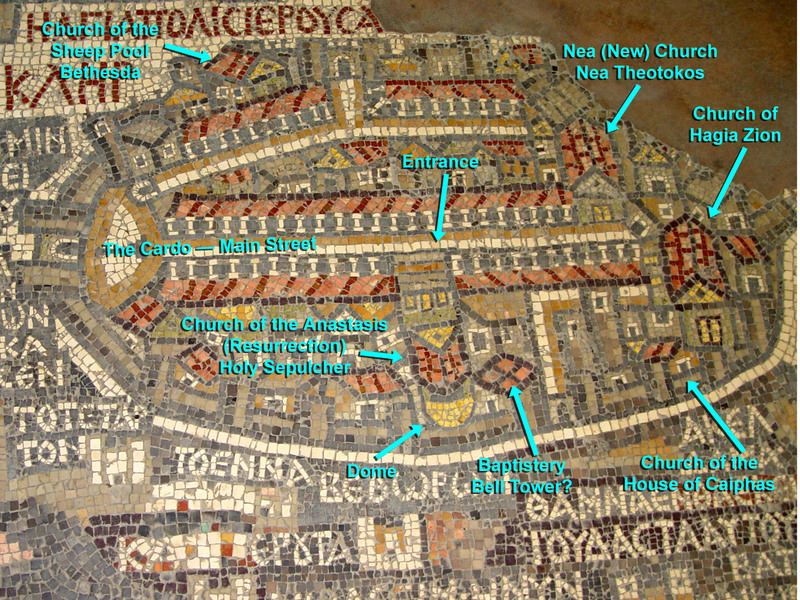 Sixth Century Map on the floor of a Church in Madaba (Jordan). The Nea Church is in the upper right corner. The map is east oriented (at the top). 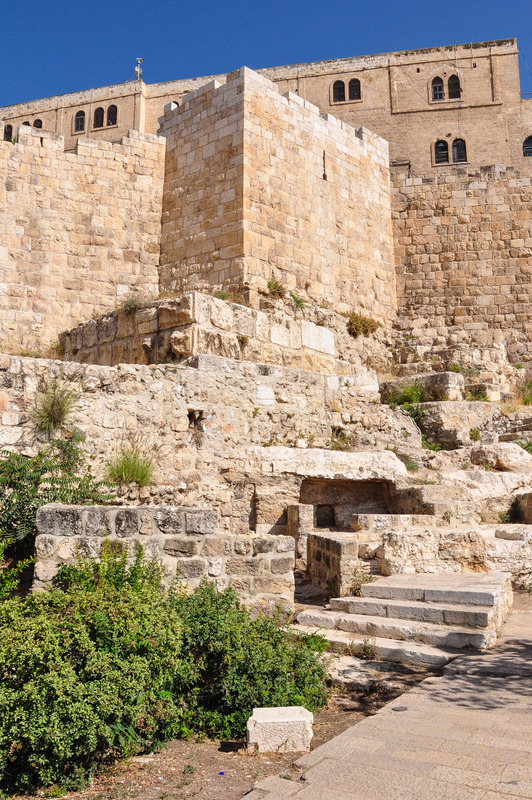 Some of the remains of the Nea Church have been excavated (Nahum Avigad) and are located in the Jewish Quarter of Jerusalem—but much of it is covered by the Jewish Quarter Parking Lot! 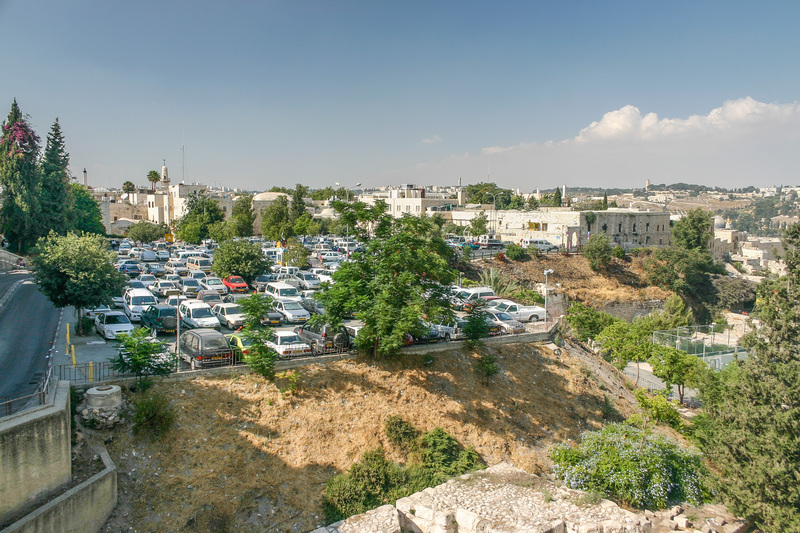 View looking northeast at the Parking Lot of the Jewish Quarter. The Nea Church is buried under part of it! View looking north at the southern wall of the Old City outside the Jewish Quarter. Two courses of the stone foundation of the Nea Church protrude from under the wall of the Old City. On March 14, 2019, AL-MONITOR published an article entitled Decades after discovery, Jerusalem’s Byzantine masterpiece may open to the Public. The article is worth a read as it describes the current state of the remains of the Nea Church. I hope to publish the next (hopefully last) installment of this saga later this week. Brandfon, Fredric. “Did the Temple Menorah Come Back to Jerusalem?” Biblical Archaeology Review 43, no. 5 (September/October, 2017): 40–49, 70. Billington, Clyde E. “What Happened to the Golden Temple Menorah?” Artifax 34, no. 1 (Winter, 2019): 18–21. This entry was posted in Churches, Jerusalem, Places in Rome and tagged Jewish Quarter, Menorah, Nea Church. Bookmark the permalink. There was an article in BAR a few years ago about the temple treasure being returned to Jerusalem and place by Justian in the Nea Church. This blog posting fills in lots of gaps. Very helpful!